Restaurants, pubs and caterers should tell diners which countries their food is from, Food and Farming Minister Jim Paice has urged. While some food products bought in store are beginning to offer this information, many caterers have not yet taken on the challenge. The appeal from Mr Paice comes 18 months after the food industry introduced voluntary country of origin labelling standards but there has been little action from caterers and no overall improvement on foods in shops, with some manufacturers actually providing less information. He is calling together businesses across the food industry to tackle this important issue so that consumers can make informed choices on production methods, environment and quality. Jim Paice will write to the British Hospitality Association asking it to advise its members to provide information on the origin of the main ingredients in meals. “More than ever, people want to know where their food comes from, so it’s disappointing to see little improvement in the number of food products showing this information. In 2011 Defra analysed labels on more than 500 meat and dairy products bought from the major retailers and a number of independent shops. The 2012 survey shows that the number of products labelled with country of origin: went down on cheese, from 77 per cent to 76 per cent; went down on meat products like bacon, ham, sausages and burgers, from 73 per cent to 72 per cent; went up on meat products like pies and ready meals, from 73 per cent to 77 per cent; stayed the same on milk, at 54 per cent; and stayed the same on butter, at 100 per cent. Other research, published by the Food Standards Agency, shows that growing numbers of people want country of origin labelling. 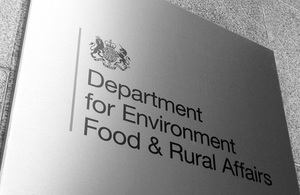 Defra will be inviting food businesses to tackle the issue together in a workshop in the autumn. It will also be researching the main barriers preventing caterers from using this sort of labelling. View the full Comparative Study to the National Country of Origin Labelling Evaluation 2011. Find out more about Country of origin labelling. Read the Food Standards Agency research on country of origin labelling.